J. Krishnamurti: Why don't You Change? An conversation with Pupul Jayakar. Watch the video. An dialog with J. Krishnamurti, Prof. David Bohm and Dr. David Shainberg. Jiddu Krishnamurti, born in Madanapalle, India on 12th May 1895 was an Indian philosopher, author, Theosoph and spiritual Teacher. Krishnamurti treats in his most important publications spiritual questions like achievement of complete spiritual freedom through meditation as well as other religious and philosophic topics. 1910 and founded for him the “Order of the Star in the East”. At the late 1920s he started separating from the theosophical movement. But only after 1947 Krishnamurti started his wide public work which he continued with full intensity and with topics adapted to the changing periods of time until his death. 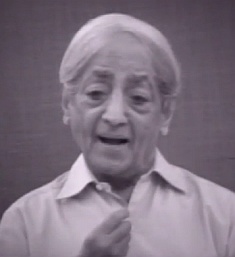 Whilst Krishnamurti had mostly conducted interviews and public discussions shortly after his separation from the theosophical society, he focused more on public speeches in the later years.